degradation, including the acidification of the oceans, the warming of the global climate system, and the loss of biodiversity. In recent years, warnings issued by organizations like the Intergovernmental Panel on Climate Change (IPCC) have grown increasingly dire. The consensus among experts, and a growing number of world leaders, is that we need to get our collective act together if we intend to leave a decent, livable planet to our grandchildren. There is no one, single “magic bullet” that can address all of those problems simultaneously. In order to answer the challenge, we will need to combine our skills of cooperation with our capacity for prudent, individual decision-making. And the workplace happens to be a venue where personal initiative and collaborative effort both come to the fore. If you’re concerned about your business’s impact on the environment, but worry about the cost or difficulty of implementing more eco-friendly alternatives, fear not: there are some simple, inexpensive techniques you can try that can make a positive difference. Invest in new lightbulbs and energy-efficient appliances. Replace your old, incandescent bulbs with LED bulbs, and make sure the office refrigerator, microwave, and dishwasher are all certified energy-efficient and built to last. Another advantage of the pursuit of energy efficiency (besides the environmental dimension) is the money you stand to save on your electricity bill. Conduct regular checks of your office’s heating system to ensure that air is able to flow freely through the vents. Instruct the last person to leave the office in the evening to turn out the lights, and make sure all of the office computers are switched off. The same advice applies to rooms not currently in use, and chargers for cell phones and other gadgets that continue to sip electricity even when the device is fully charged. Unplug these when they’re not needed. If possible, try scheduling “work from home” days. One of the primary sources of vehicular pollution in our society is the daily commute to-and-from work—cars, trucks, and buses idling at stoplights and sitting in traffic. Instead, encourage your team to work from home if they can. With the communications technology available today, there is often no need for professionals to congregate in a single location in order to keep in contact with each other and get work done. Many municipalities have citywide recycling programs, and some (like Vancouver, B.C.) have municipal composting programs. By separating recyclable items and organic materials from garbage, you’ll save space in your waste receptacles, conserve energy and, ultimately, contribute to the diminution of landfills and refuse processed at incinerators. If you have a lot of old documents with text on only one side, conserve paper by writing on the other side. Set aside a trove of defunct, one-sided documents for this purpose. 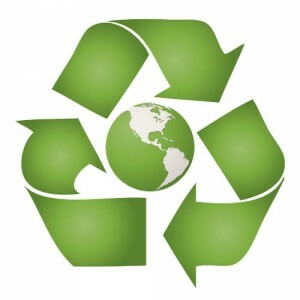 Order paper products made from recycled material. A wide variety of paper products made from recycled materials—including plates, napkins, paper towels, toilet paper, tissues, and document sheets—are available for purchase in stationery stores and through wholesale distributors. Whenever possible, try to order such products, particularly if they are compostable. If your work is finished early, go home. Many businesses operate on the basis of set hours, like the stereotypical “9 to 5”. But unless there’s a good reason for you to remain at work throughout the allotted time period, you’re better off shutting down your computer, cutting the lights, and heading home. You may even profit from the opportunity to beat the evening rush, which will save you fuel (better for both the environment and your bank account), and spare you frustration. Spend some of your free time enjoying the natural world you’ve helped to preserve!